is a raindrop, rather than an orb, since it was raining when I took this particular photo. 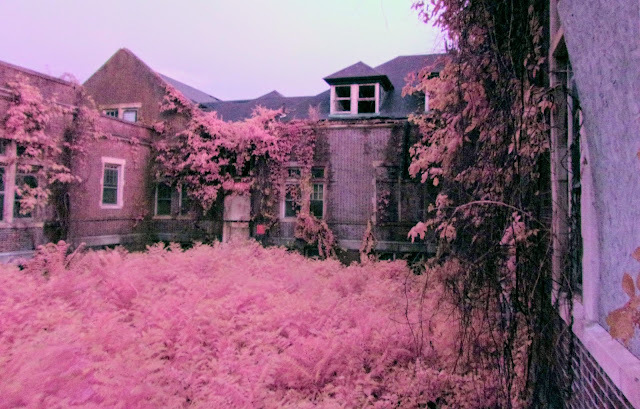 Pennhurst State School and Home for the Feebleminded still haunts Spring City, PA. The facility began its service to Pennsylvania in 1908 as an institution for mentally and physically disabled individuals. It closed its doors in the 1980s, only re-opening in 2010 as a museum and seasonal Halloween attraction. Looking out a window in the Mayflower building onto another wing of the building. 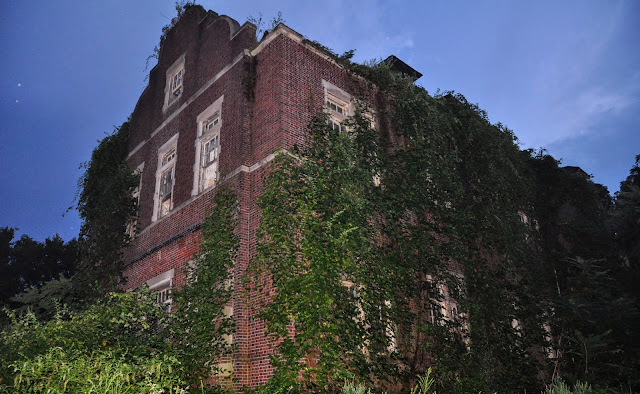 Several ghost hunting shows have filmed episodes at Pennhurst; but you don't need to be on a TV show or sign up with one of the commercial ghost hunting organizations to go ghost hunting there. 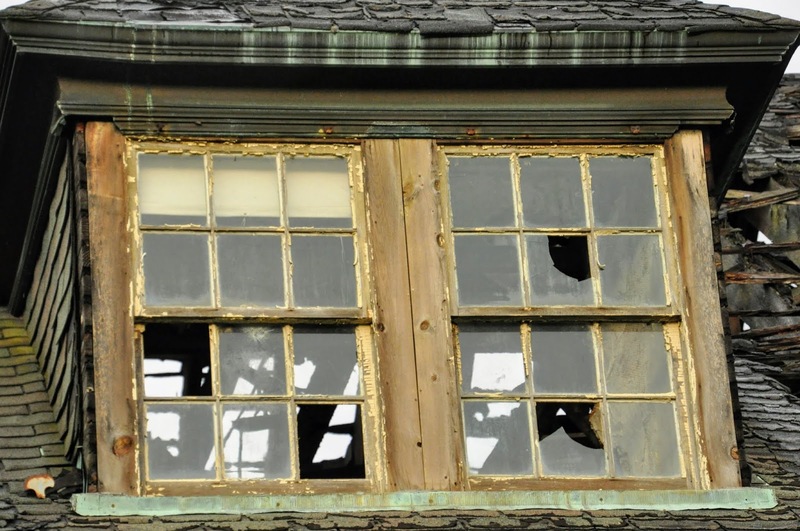 Pennhurst periodically sponsors its own ghost hunts. The ghost hunt, which ran 7:30 p.m. - 3:30 a.m., began with a tour of the grounds. 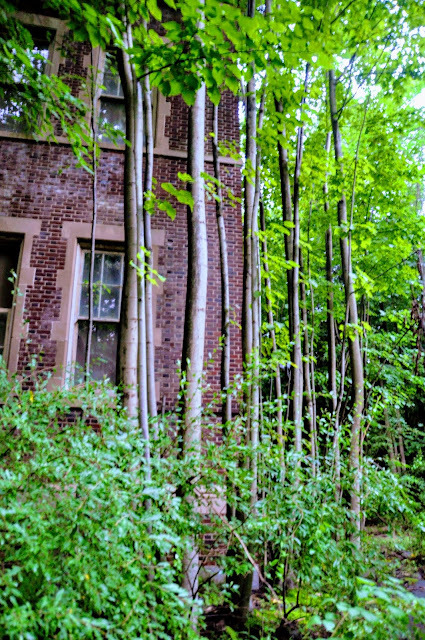 Although the ghost hunt focused on the Mayflower building and several tunnels, we walked by the Administration building to the ruins of the old hospital, caving in on itself and slated for additional demolition. 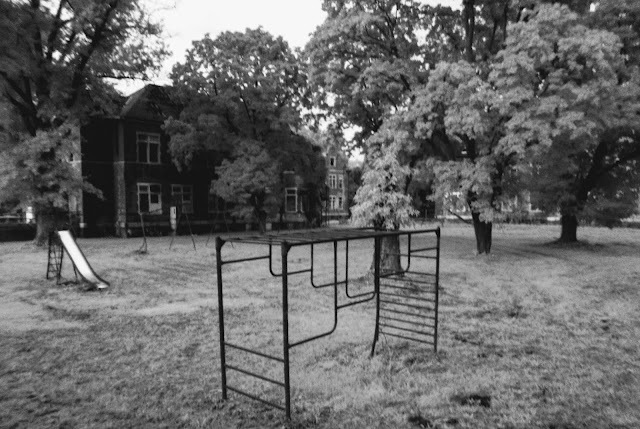 We walked between the schoolhouse and the old hospital, then took the catwalks around the campus to see the other buildings. Only a few of the buildings are actually safe enough to enter. Eerie really doesn't begin to describe what it's like to wander around in the shadows of these crumbling ruins, as the sun sinks into night. It's not hard to imagine encountering the spirits of former inmates or a ghostly figure peering down at you from a window. The older buildings, designed by Phillip H. Johnson, were two-storied, and made of red brick, terra cotta and granite trimmings. They were connected by fire-proof tunnels with walkways -- the catwalks -- on top of the tunnels for transporting residents. deliberately caved it in to prevent trespassers from being harmed. In 1913, the legislature appointed a Commission for the Care of the Feeble-Minded which recommended a program of custodial care because individuals with mental or physical disabilities were "unfit for citizenship and posed a menace to the peace." 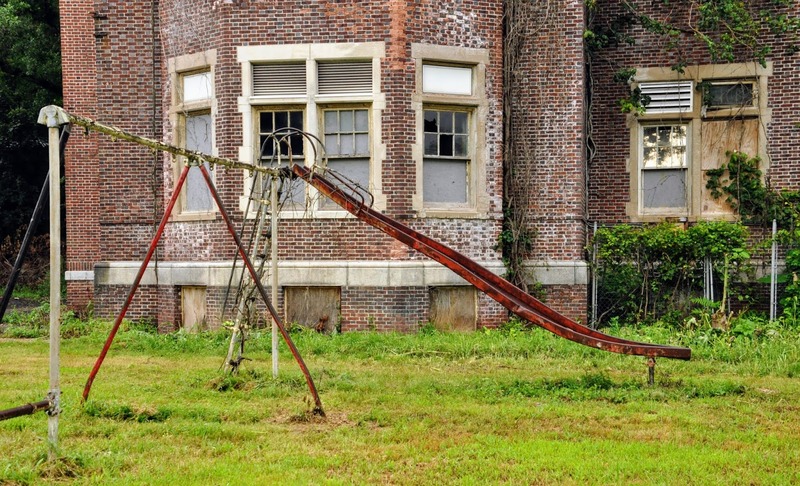 Eugenics reared its ugly head: the Commission's real goal was to prevent the intermixing of the genes of those held at Pennhurst with the general population. Pennhurst was built to be a pleasant prison for folks who didn't fit in. 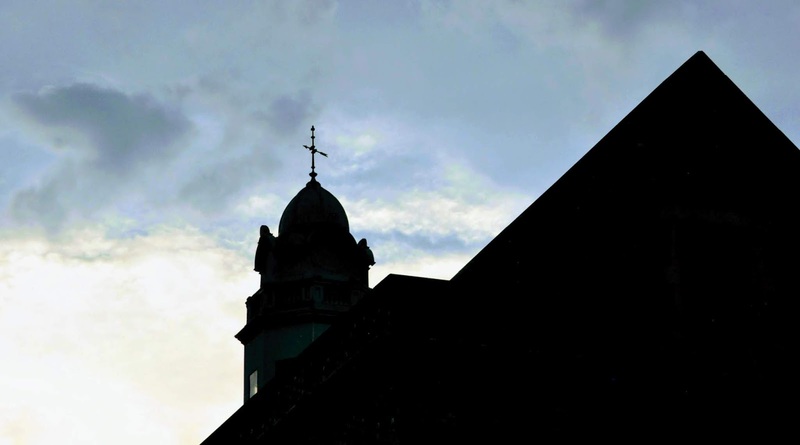 Whether its beginnings were ever rooted in concern for the well-being of inmates is debatable. Conditions at Pennhurst rapidly became unsanitary, inhumane and dangerous for its residents, many of whom were children. 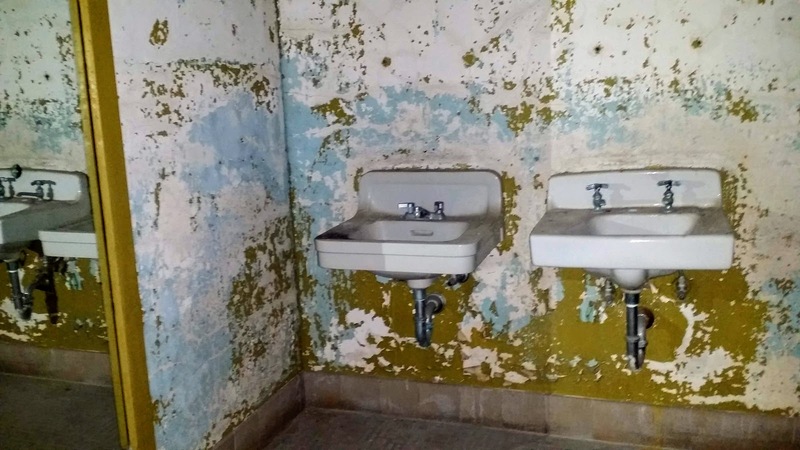 Finally, when a family visited its daughter, a resident of the facility in the late 1970s, they saw bruises on the child's body and filed a lawsuit; the court found that conditions there violated the 14th Amendment and that an institution must be closed based on a constitutional right to community services. 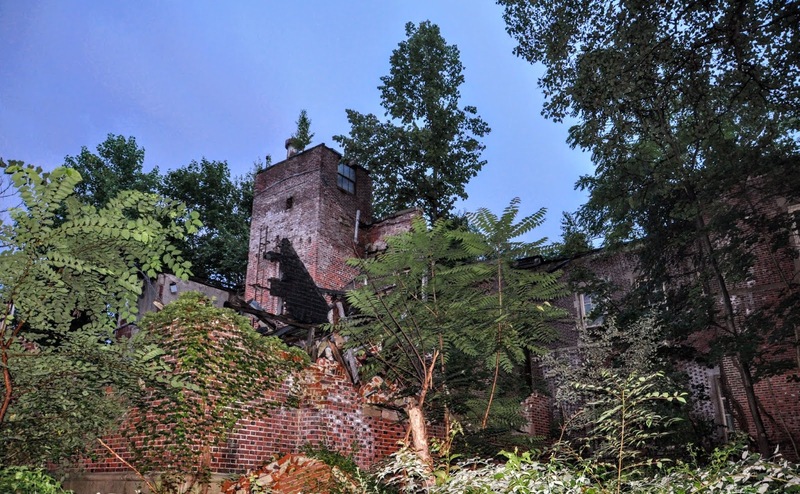 The case became an important rule of law known as the Pennhurst Doctrine, which has been cited by state Attorneys General as binding precedent under U.S. constitutional law. Everything is overgrown. The weeds in the courtyard are at least waist high. The facility closed shortly afterward and was largely abandoned, although a veterans home was placed on part of the campus. 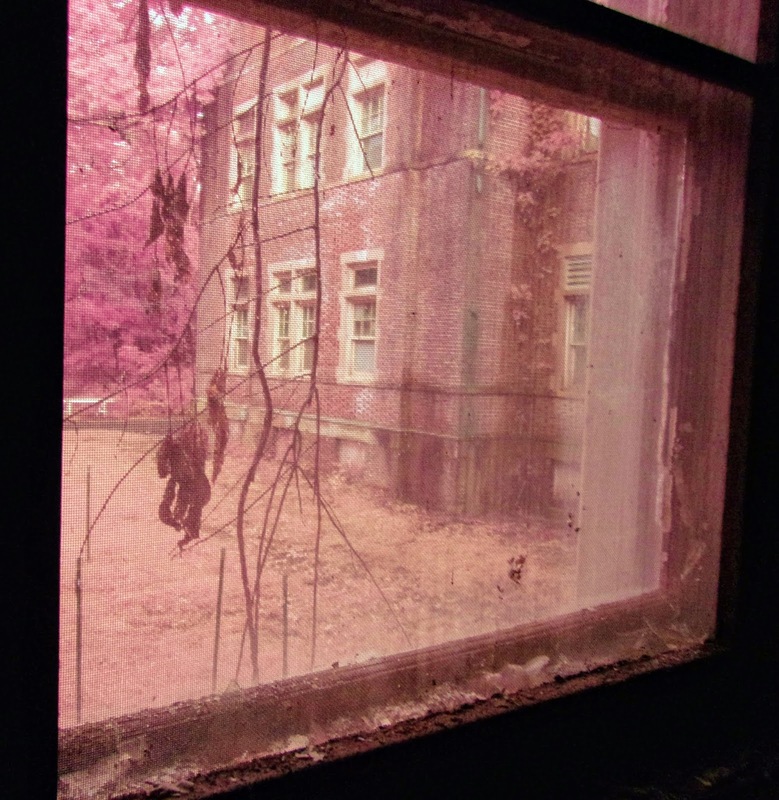 who suffered the inhumane conditions at Pennhurst were children. Although there are no stories pointing to specific ghosts, ghost hunters have experienced poltergeist-like and demonic activity. Spirits supposedly have touched and shoved ghost hunters, and thrown objects at the research team. 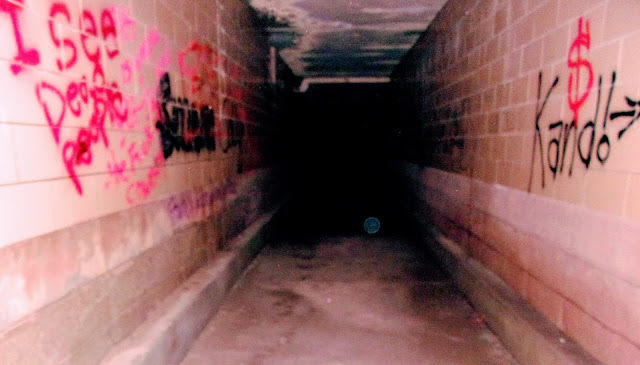 An entity supposedly even scratched a ghost hunter during one of the more active evenings, possibly indicating demonic activity or a specter manifestation. Armed with this foreknowledge, we were a bit apprehensive about what we would find. A possible giant orb in one of the tunnels that run below Pennhurst. After the tour of the campus, our guides primed us with stories of what previous groups have found, and told us about King, who apparently lives in the basement of the Mayflower building; Emily, a child who lurks on the first floor; a nurse who haunts the third floor; and the third floor bathroom that weirds out group after group. 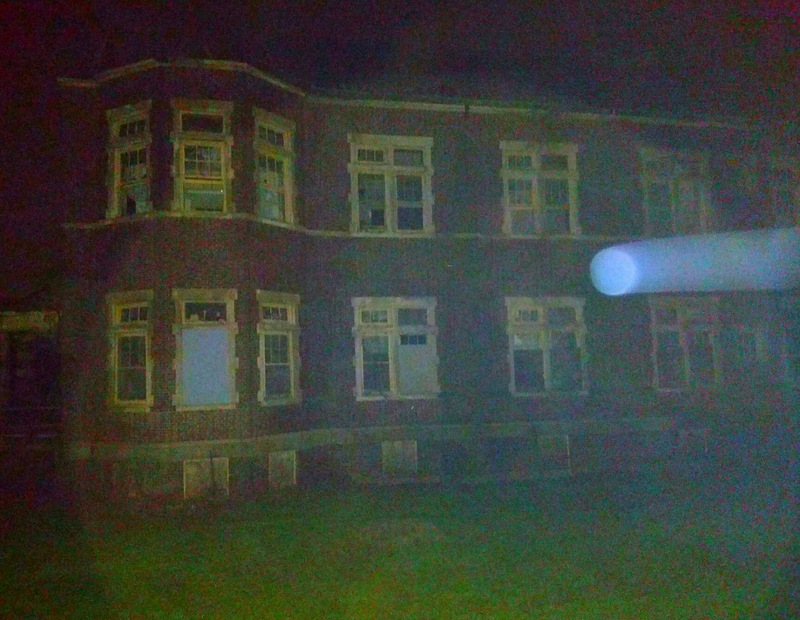 This photo was taken the night before and shared with us by the Pennhurst Staff. We then broke up into smaller groups, ending up with three amazing (slightly) older women who totally embraced the fun and atmosphere of a ghost hunt. They were enthusiastic believers in the paranormal, and that made it really fun. During the ghost hunt, we found eerie silence, the occasional bangs and footsteps echoing down the halls (in fact, as we were waiting for the ghost hunt to even start, we hung out in the hallway of the first floor of Mayflower Building; having arrived early, there were on three of us in the hallway, and we were rewarded with an echoing bang from the nether-regions of an upper floor). We brought an EMF reader and dowsing rods as well as a variety of cameras. 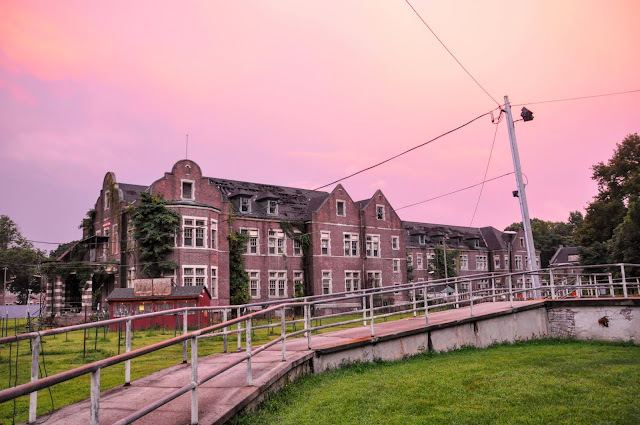 Pennhurst allowed us to borrow some ghost hunting equipment for the duration of the ghost hunt, so we also snagged a temperature reader and a spirit-box, which cycles through radio-frequencies occasionally spitting out words, supposedly in response to questions we ask. Our EMF readers periodically flashed, seemingly in response to questioning. Our dowsing rods, likewise, seemed to indicate some unexpected reactions to the spirits with whom we though we were chatting with. 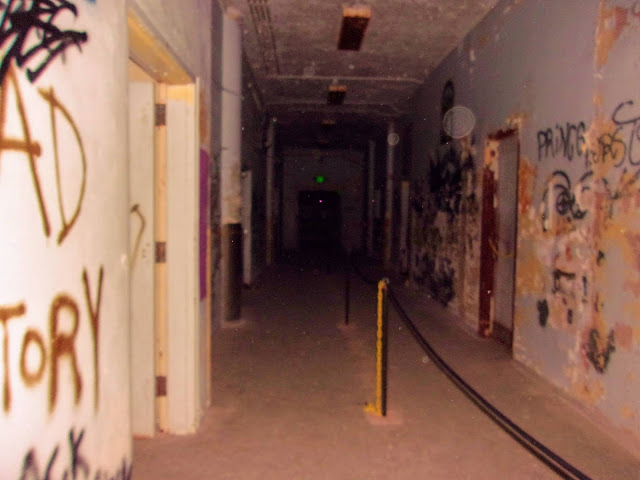 You are likely capture ghostly activities like orbs, hot spots, cold spots, EMF surges and EVPs. Members of our group reporting tingling and bad sensations, although usually the feeling was not negative. We spent a lot of time on the third floor and basement of the Mayflower. Like other groups, we got freaked out in the third floor bathroom. But on the second floor, we enjoyed a lengthy session with a spirit named Gertrude who preferred NOT to be called Gertie, although she said that was her nickname. Although at first we thought she might have been a child spirit, that became unclear later in the session. Research on our way home indicated that several residents named Gertrude were at the facility over the years, in the for-what-it's-worth category. 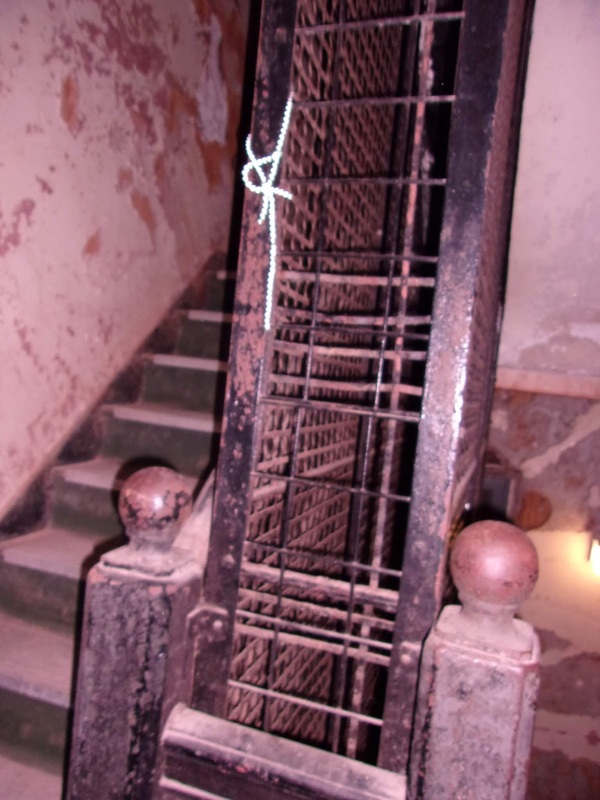 Like other previous ghost hunts we've been on, this one only created an appetite for others. Stay tuned! Hours: Check the website for dates and times of tours and ghost hunts. 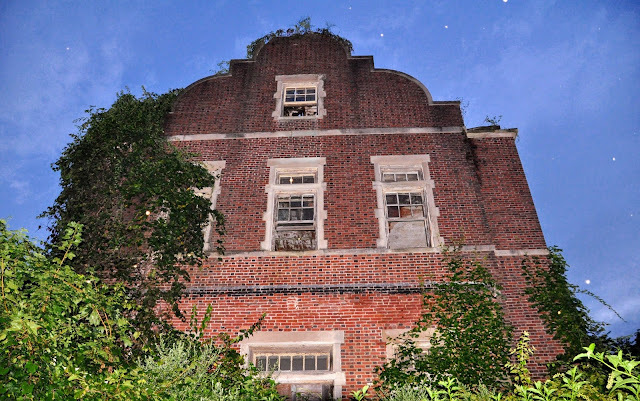 Have a Hauntingly Great Time in Lewes DE!